A modern fairy tale set in ’50s New York, The Hudsucker Proxy is the Coen movie that probably best combines all of their early obsessions: classic movie tributes, pitch black comedy, and set pieces to leave you grinning for years afterwards when you remember them. 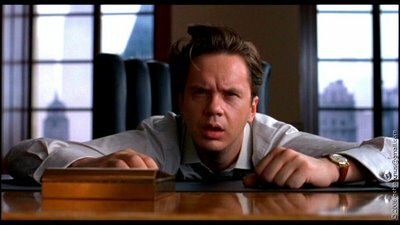 Tim Robbins is ideal as a wide-eyed, lumbering business graduate hoping to make it in the big city but rapidly dismissed as an "imbecile" by Jennifer Jason Leigh's spitfire newspaper reporter--as good as she’s ever been especially when executing the best screwball dialogue since Rosalind Russell traded barbs with Cary Grant in His Girl Friday. For fans of The Wire there’s an early appearance by "Pres" Pryzbylewski as the world’s most annoying lift operator, there’s Paul Newman playing old (he was old for a very long time), and the Fascist deco look of the piece is brilliantly realised in a loving parody of that familiar Technicolor palette by Roger Deakins who shoots all the Coens’ good films.